Is a Copper Roof a Good Choice in Snow Country? Yes! This is one of those situations where you can get great looks without sacrificing performance. 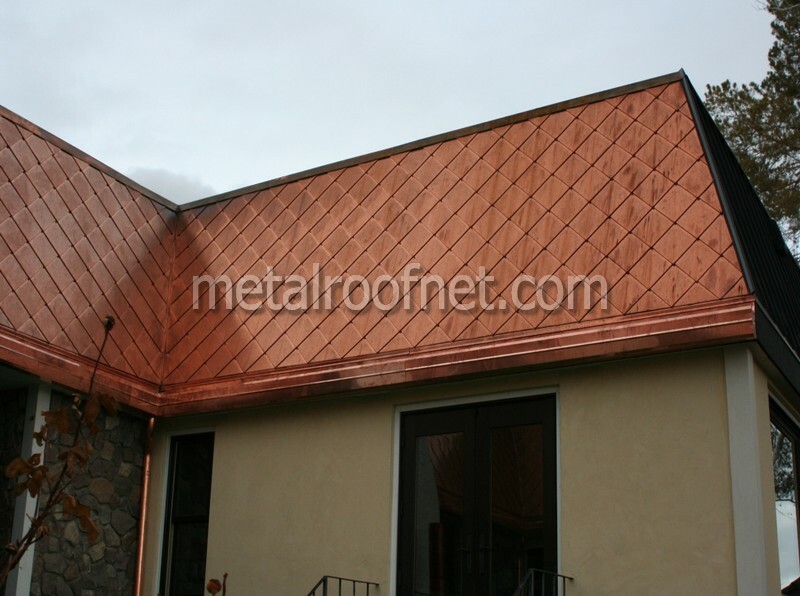 Most copper roofs are as strong as steel or aluminum roofs, and so they can work great in snow country. 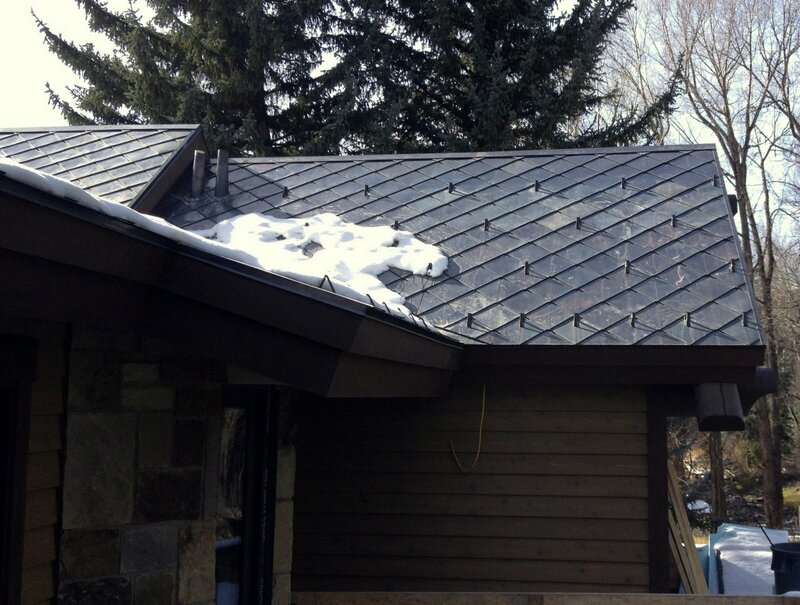 The factors that affect the suitability of a copper roof in a region that gets heavy snow are true of other metals as well: gauge; profile; roof configuration; execution of installation. Copper Roof prices - as volatile as the commodity itself? When people are researching prices and options for their copper roof projects, we tend to hear the same question: do fluctuating commodity prices affect the material cost? The short answer is, “No, fluctuations in the price of copper don’t have a very big impact on the price of your finished copper roof.” Here's why. 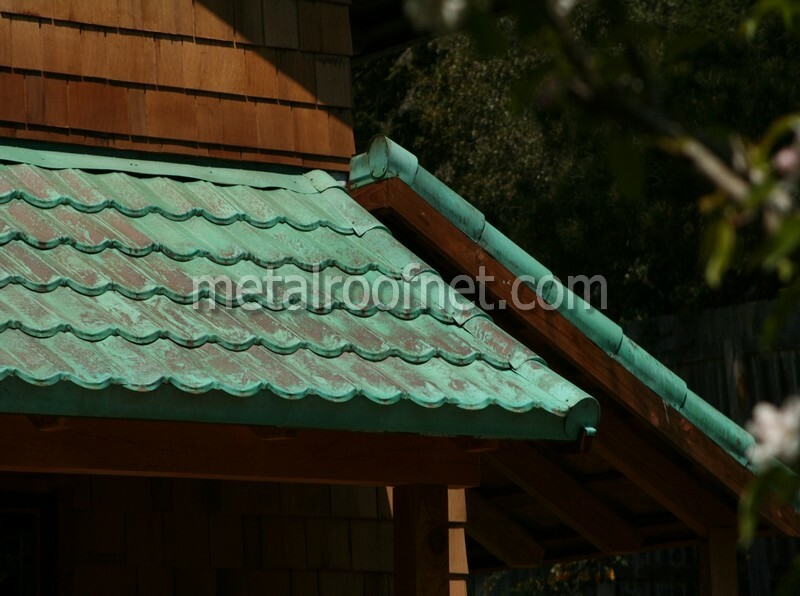 Copper roofs are among the quintessential roofing materials on the market today. Centuries of use (have a gander at the copper-topped cathedrals and churches across Europe, some of which are centuries old!) have proven their performance and longevity, and there's simply nothing looks-wise that compares to a beautiful copper roof. 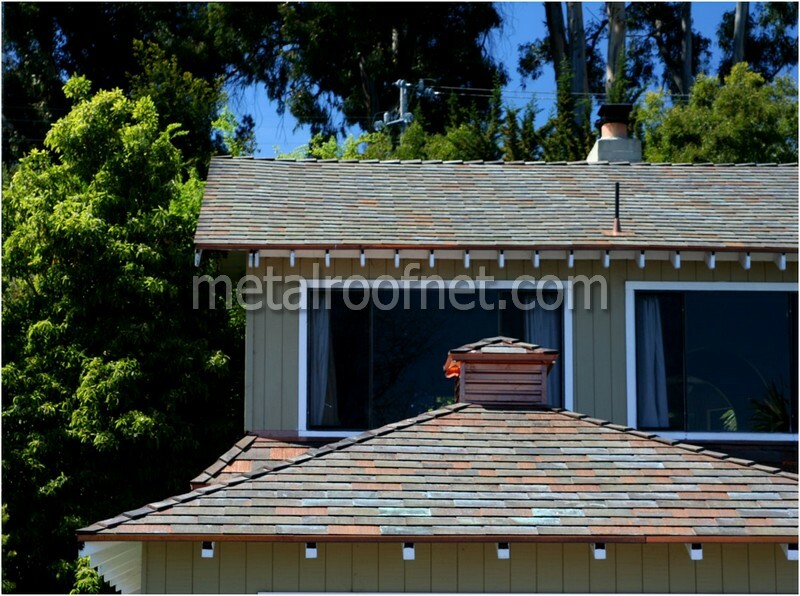 This is a beautiful copper roof system in California that blended solid copper shingles left shiny and new with copper shingles that were hand-treated to achieve a patina. 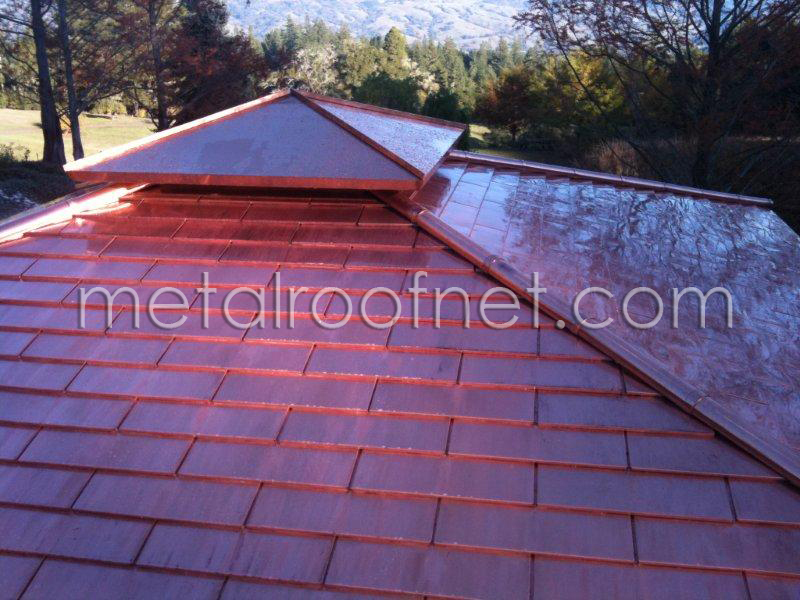 Copper Roofing Materials - Our Specialty! This is a copper roof photo that was taken mid-installation during a very beautiful and unusual project: a copper-roofed turret for a custom home in the San Francisco peninsula area. 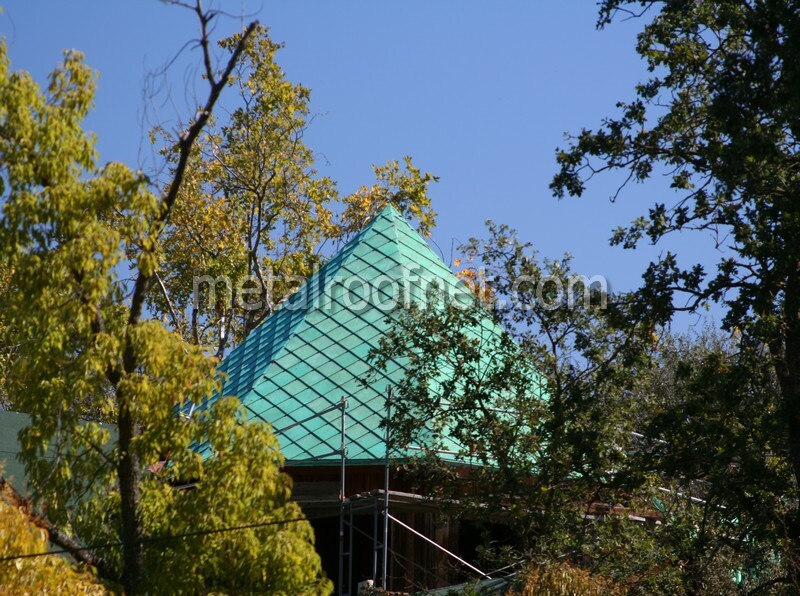 The client, a retired architect building his "dream home," wanted something spectacular and unusual to finish off his very distinctive new home, and chose our copper diamond roof shingle - wise choice! The shingles were then individually treated with a special solution to mimic decades of exposure so they'd display that special "patina" that is unique to old copper roofs. This was a very interesting re-roofing project in which to be involved. The original black-painted wood shingles on this mansard were past their useful lifespan, plus the house was on the edge of a ravine so fire was always a concern. The owners wanted to do something permanent and distinctive with the mansard because it's an extremely prominent architectural element. They chose to have us fabricate new standing seam panels and supply our elegant copper diamond shingle for the mansard over the front door. We also designed and fabricated the custom copper gutter system for the same area.